Whether you regularly entertain a big group or dine in a small space, be inspired by these 5 dining tables. This lovely round dining table has plenty of space for a family. A table of this size and shape goes well with a larger light fixture. Pair it with some Scandi style wooden chairs or moulded plastic seating for a thoroughly mid-century look, or combine eclectic elements for a unique space. Breakfast, lunch, dinner, and great conversation are very welcome here. For a larger space or entertaining a crowd, this farmhouse dining table gets the job done. 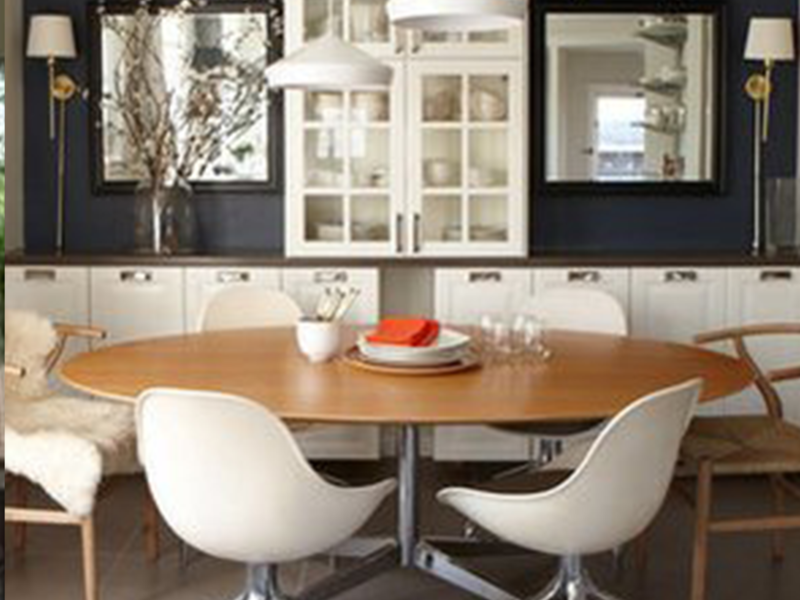 The natural wood goes well in almost any room, and you can fit your choice of dining chairs around it. Host a family holiday gathering, display your favorite flowers, or spread out for homework, hobbies, and projects and still have room to enjoy lunch. In a small or dual-purpose space or even as a more casual option, the traditional coffee table can serve as a cozy, informal dining area. Spread out some hors d’oeuvres or light some candles to dine more intimately. An enjoyable dining experience doesn’t have to be big and formal. A square table is usually a good fit for square rooms, depending on traffic flow through your home. Big enough to hold a festive meal, finish up homework, or as a decorative centerpiece to the room, it can also work well placed against a wall if fewer seating spaces are needed. This sturdy wood table has a bit of a Scandi farmhouse vibe but its size doesn’t overpower the room. A bench gives some added versatility with seating and space, and a mix of finishes provides some texture and contrast. 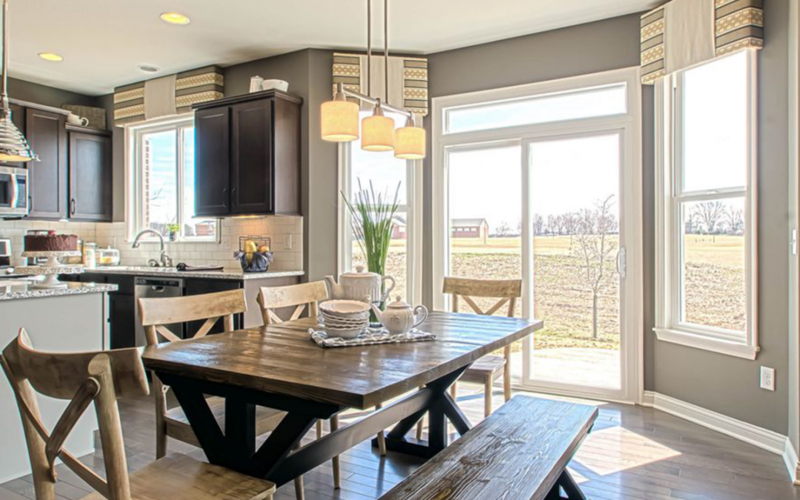 Enjoy time with family and friends around this handy-to-the-kitchen table. Inspired for Life? Read about more living arrangements below. To highlight the beauty of a space, or even to boost your health and mood, there’s really nothing like natural lighting. See how splendidly these five homes use nature’s generous bounty. These sleek floor-to-ceiling windows give an awe-inspiring openness to this small office. From sunrise to sunset you’ll benefit from the green energy of natural lighting and the quiet rhythms of the outdoors. Forget endlessly slogging through your tasks under fluorescent lights; inspire your work with the vibrancy of nature. 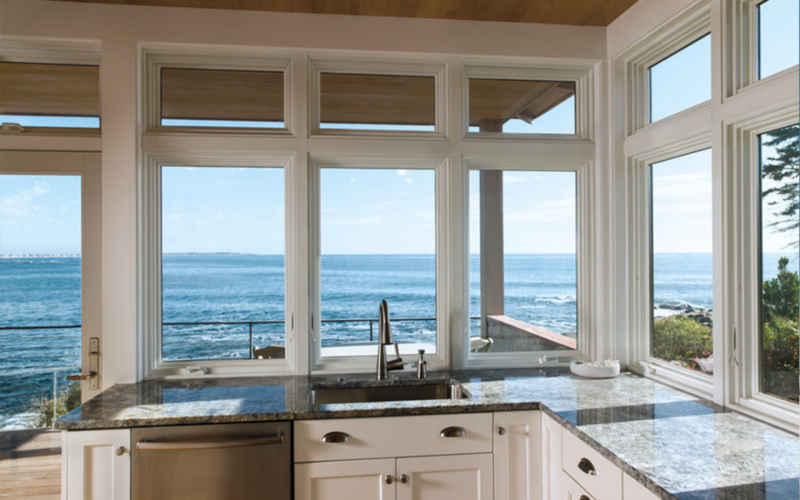 This kitchen enjoys an unmatched view of sea and sky, and is bathed in abundant natural light. 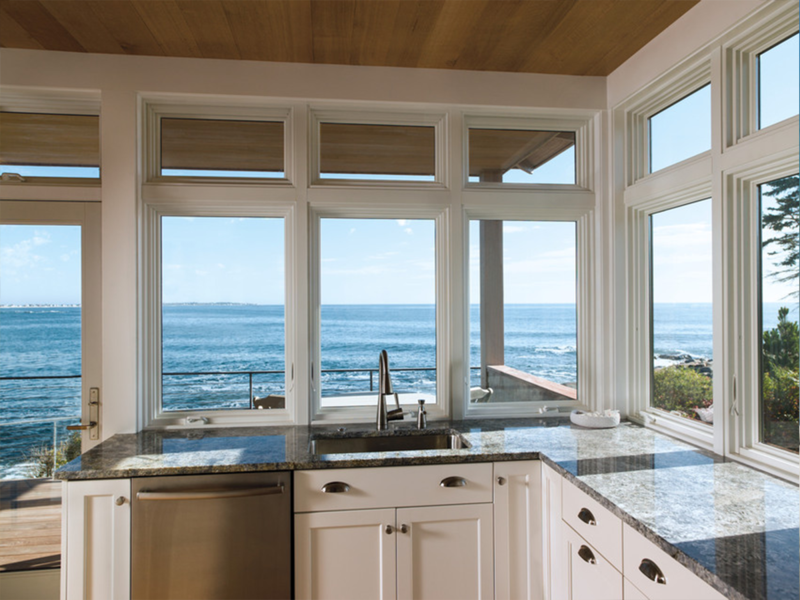 Windows that reach from ceiling to worktop provide a nearly uninterrupted view as well as plenty of light in which to cook and meal prep. The disinfecting quality of sunlight will certainly be welcome in this space, and your spirits will be buoyed while you work. Forget bringing the outdoors in, take the indoors out! This stunning courtyard offers privacy from neighbors, plenty of greenery, a comfortable space for relaxing or entertaining, and obviously has natural light in profusion. 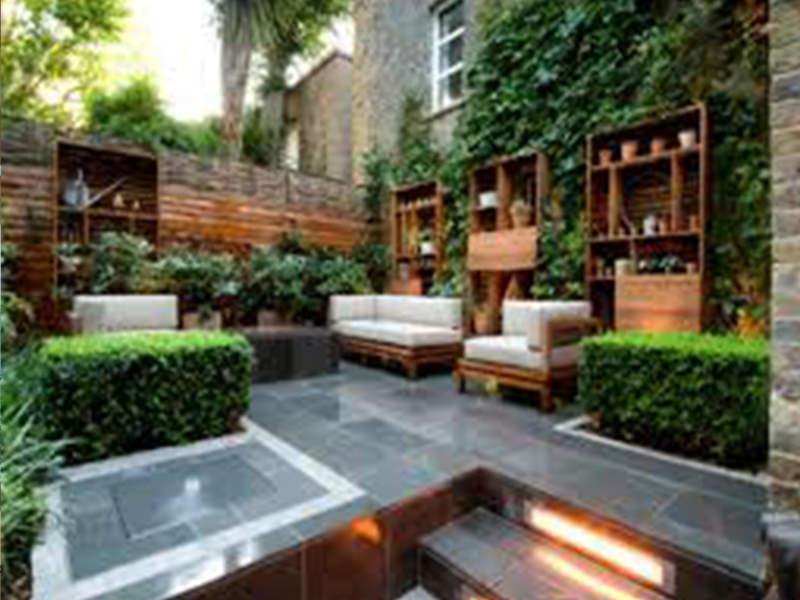 Carefully consider the location of your outdoor room and choose a spot with indirect lighting, at least for the time of day you plan to use it, and find rest and rejuvenation right outside your door. 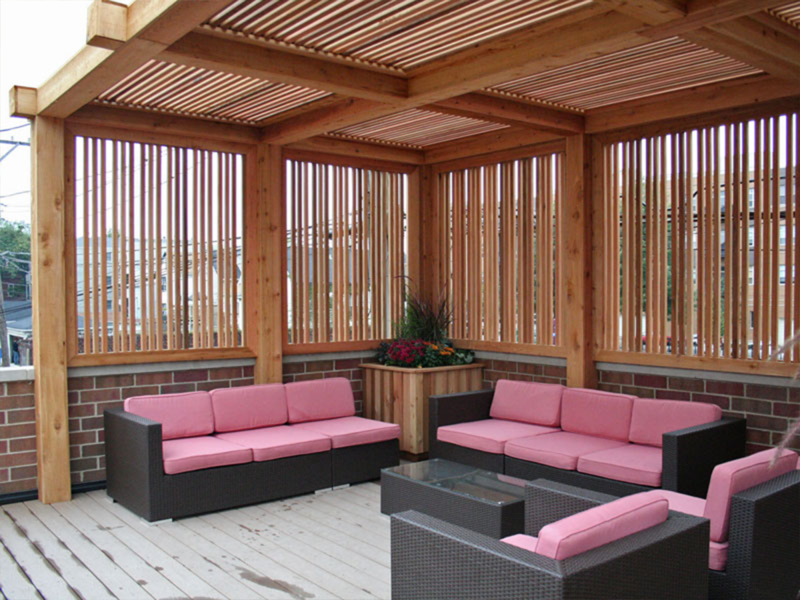 If your patio area doesn’t offer much shade or is a rooftop location, a pergola or other light-diffusing structure can provide both privacy and protection from the direct rays of the sun. Enjoy an extended or second living room with some comfortable furniture, and keep the grill nearby for easy entertaining. Planters with flowers or even a tomato plant can take advantage of the natural light while greening up the space – even if it is not at ground level. 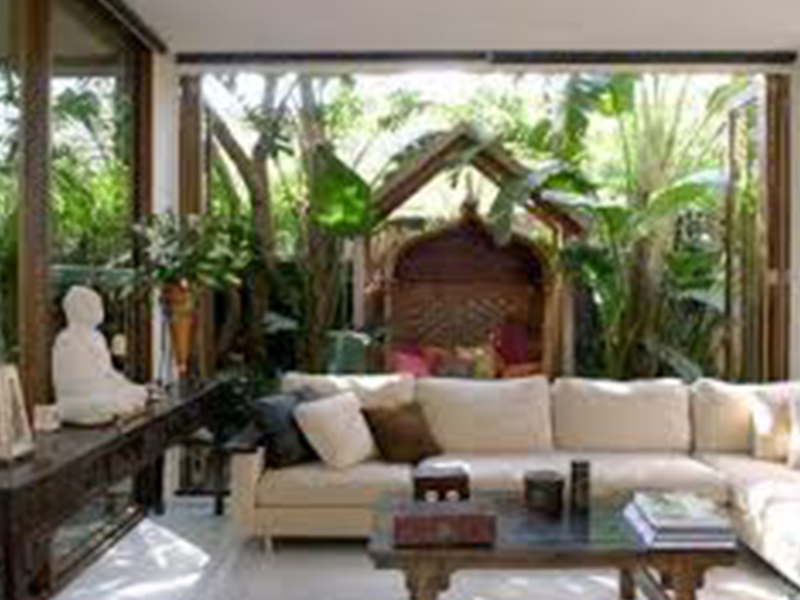 This semi-tropical living space enjoys the very best of both worlds. Open to the outdoors, this room has retractable blinds that can be employed when the weather calls for added protection. In mild weather, trees and greenery diffuse sunlight for a calm, verdant alcove. 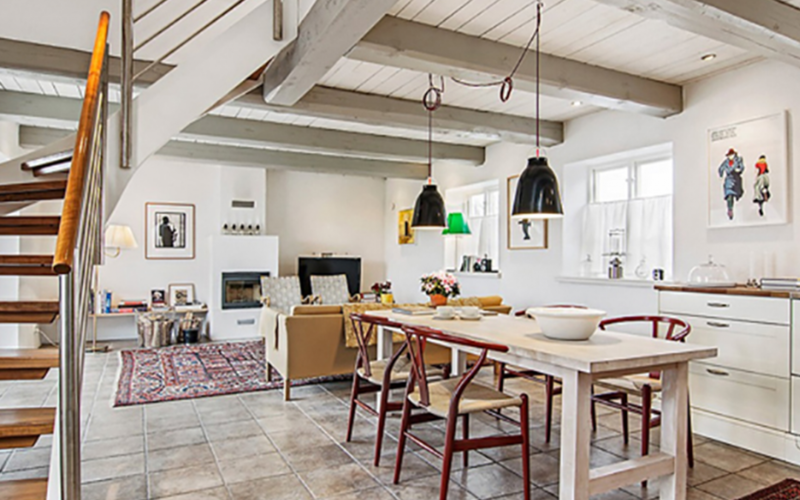 In a Scandi farmhouse, you don’t have to sacrifice style in order to have a productive, useful space. These four examples showcase some truly functional, beautiful rooms. 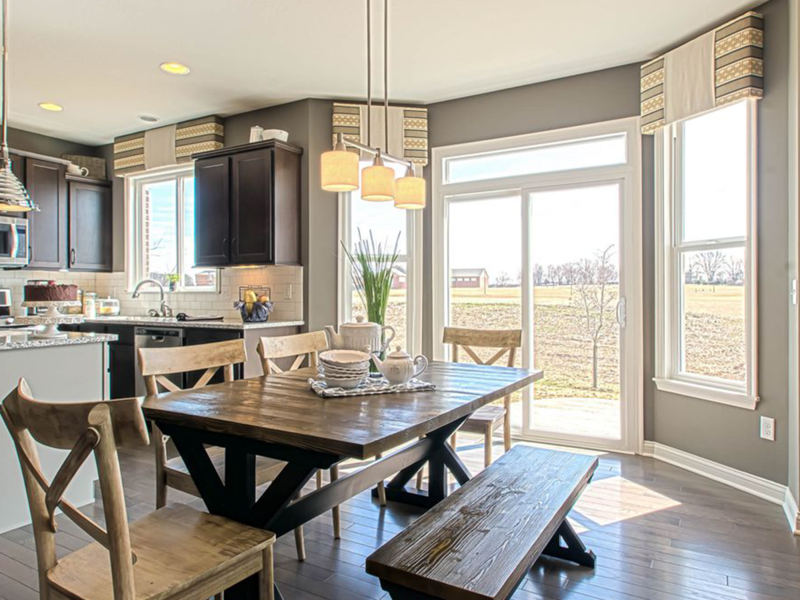 This open kitchen-living area exudes a comfortable, practical beauty. 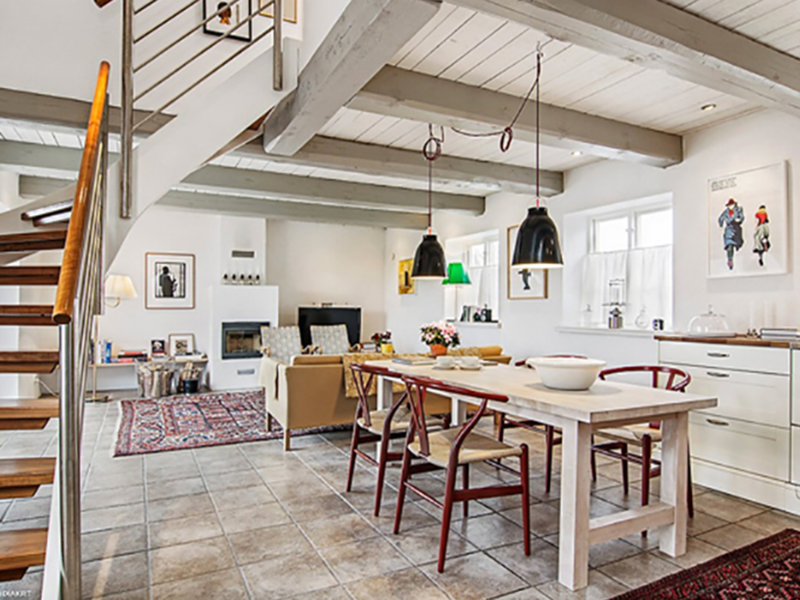 You can enjoy rustic charm with a sturdy farmhouse dining table and painted ceiling beams and boards, but add some modern dining chairs and a stylish sofa to keep this nordic farmhouse feeling airy and modern, if eclectic. 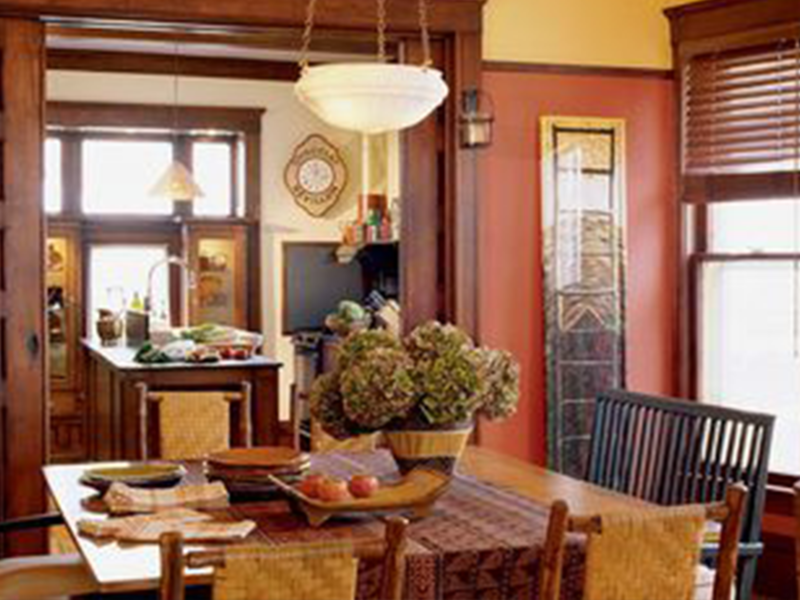 Beautiful dinnerware is useful as well as decorative in this welcoming, functional room. 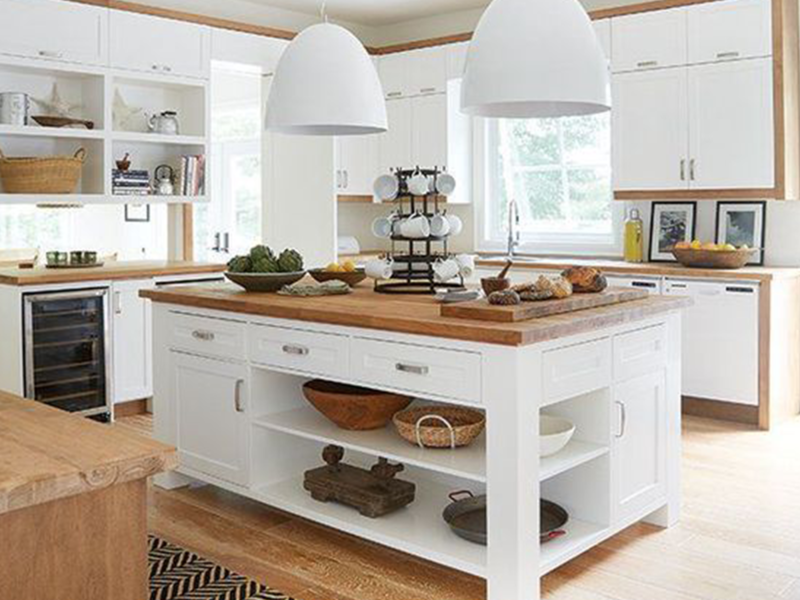 Natural materials and natural lighting set the tone for this working kitchen. Wood floors and worktops make the space warm while clean white cabinets and fixtures give a bright airiness to the room. Natural fibers in the rug and baskets fit well with the nordic farmhouse look, and useful dishes and cookware are displayed in open shelves. The large central island works with the oversized modern pendant lights and offers a convenient way to display and store coffee cups, handy for your morning pour over coffee, perhaps? This small space doesn’t forfeit either utility or Scandi style. Natural brick and wood bring an earthy feel to the otherwise crisp, white mudroom where a handy bench and painted chairs offer a convenient spot to put on (or remove) outerwear. 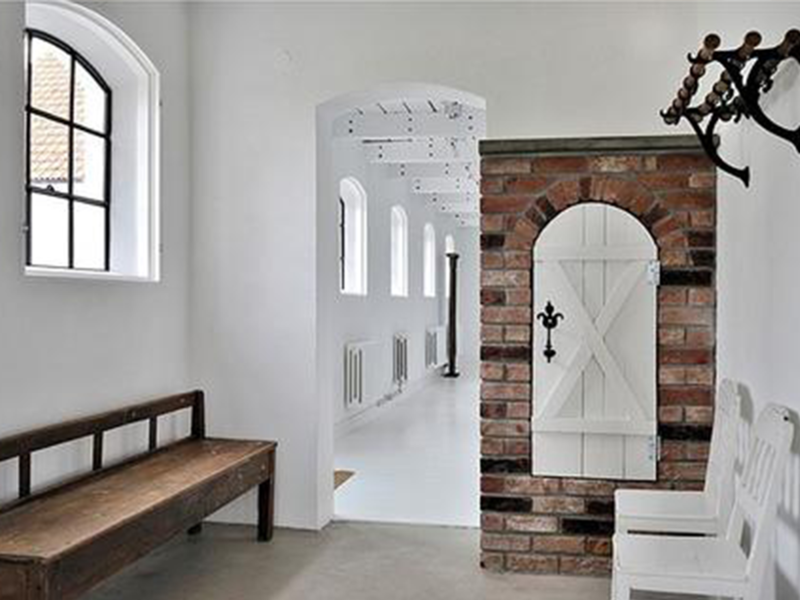 Arched windows and doors provide natural light and some movement in the square, boxy room. Guests can hang coats and a unique cupboard offers out-of-the-way storage. A warm welcome on a cool, crisp day, this room is just waiting for friends and family to gather. A Scandi style table and linens are eminently functional and the tablescape is beautiful to behold. 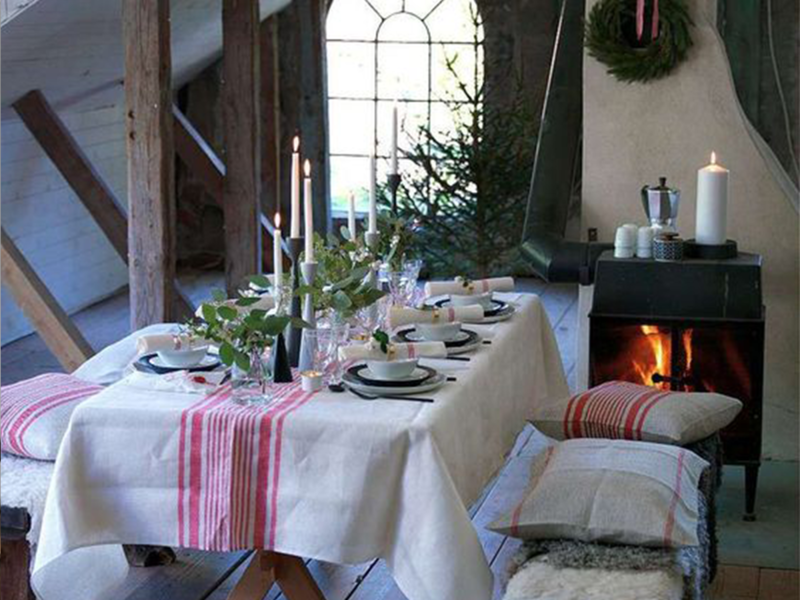 Stylish dinnerware and an abundance of candles and greenery provide a festive air. An arrangement of pillows and rugs are a comfortable contrast to the stark, rustic floor and the stove doubles as a sideboard where coffee waits to be shared. 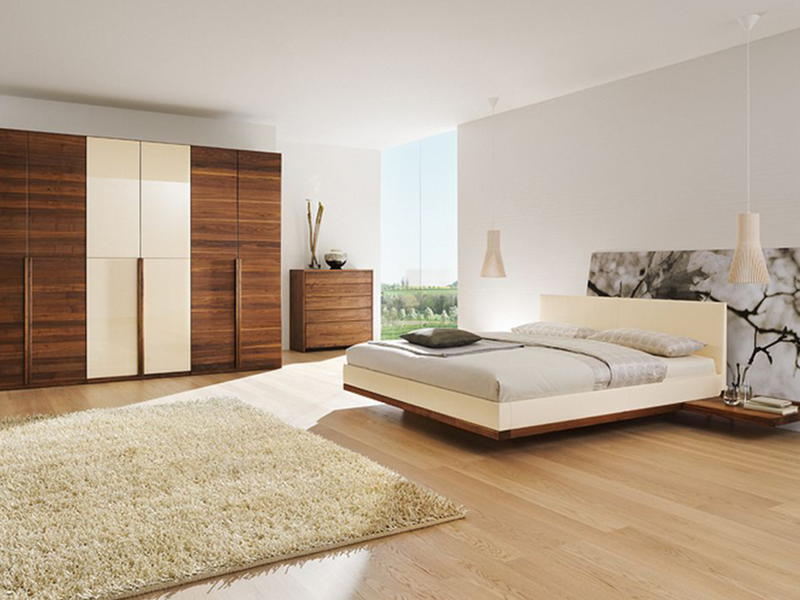 As the room primarily devoted to rest and relaxation, the bedroom might benefit the most from a clean, modern design. 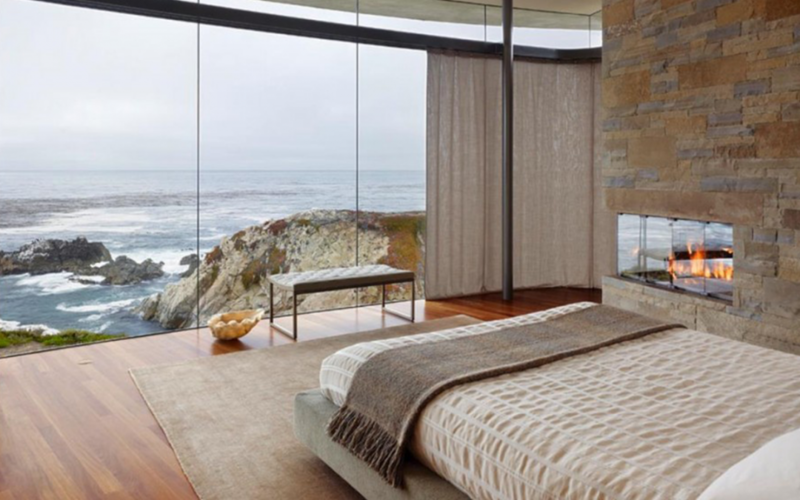 Be inspired by four unique modern bedrooms that inspire below. 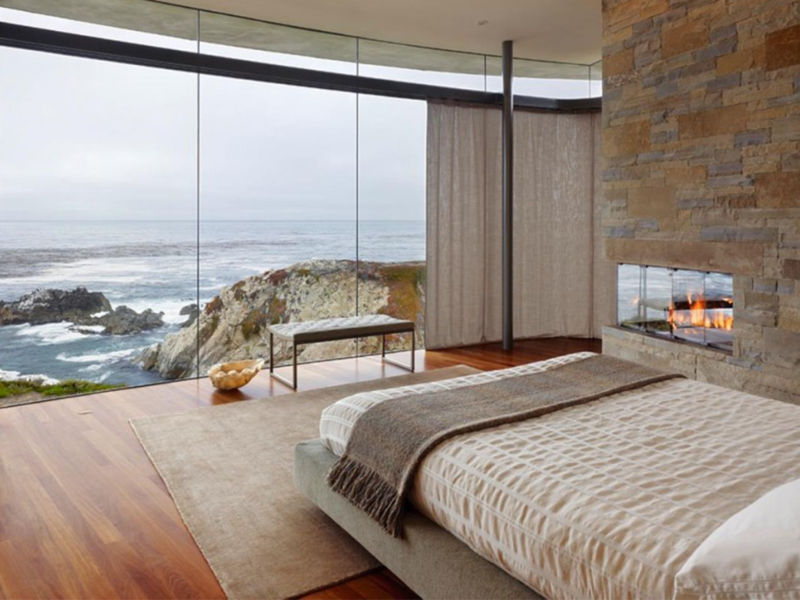 Natural elements are clearly at home in this modern bedroom. A wood floor and stone fireplace give a grounding effect to the room, but aren’t alone. Air, water, and fire all have their role and provide calming energy to the space. Neutral fabrics and fibers continue the theme of quiet harmony with the world and invite serenity. Relax and rejuvenate while you reestablish your connection with the natural world. This modern bedroom is all about lines. From the contrasting definition of parallel floor planks to the integrated lighting, straight, clean lines establish style in this space. Symmetry also plays a part, with long lines framing the primary feature of the room, the bed. Smooth, polished materials in walls, tables, and chair leave room for the soft, tousled contrast of the linens. Retreat from noise and busyness in a place where you can enjoy balance. 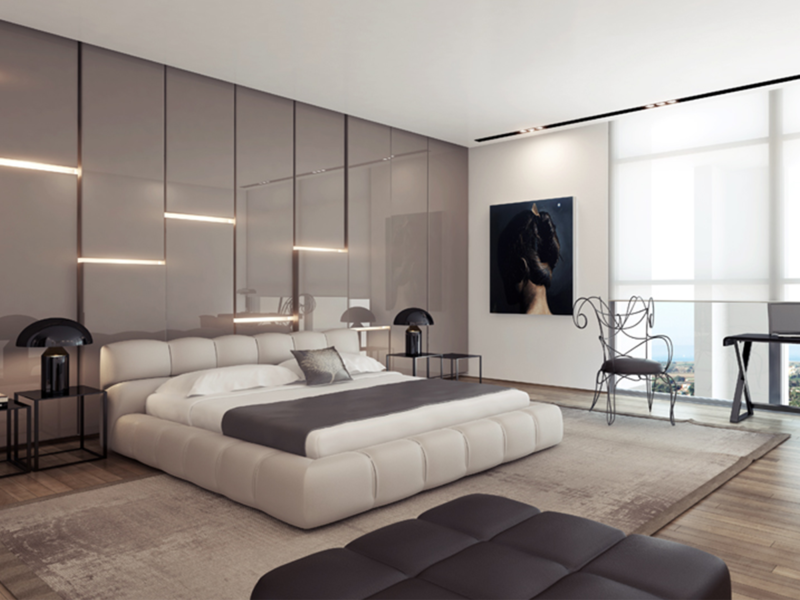 Monochrome and muted neutrals provide the palette for this lavish room. Black, domed lamps and side tables add a masculine feel and the ample natural light and white bed keep it from feeling heavy. Add a modest work zone if you have the space, or a unique accent chair. A large area rug brings cohesion to the various elements of this room. 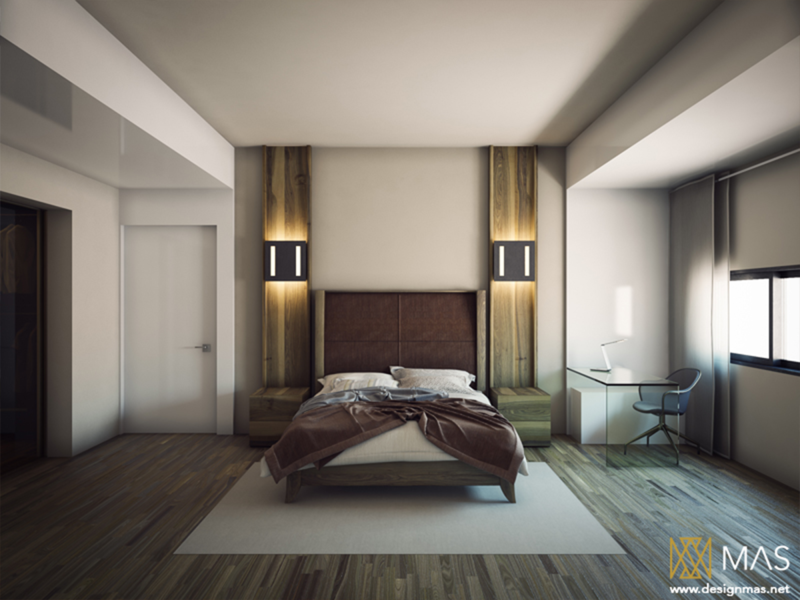 This modern bedroom enjoys a mid-century vibe with its platform bed and wood toned wardrobe. Hanging bedside lamps are a nice addition for purposes of both style and utility. The lighter wood floor adds a Scandi feel, as does the plush area rug. Don’t feel like you can’t break a few rules; add a touch of interest with creative wall art placement. At North Hem Furniture, we love to work with other local businesses to showcase our product in ways that are economical and easy for our diverse customer base. One of our local business partners is Journey’s Kitchen and Bar. In their beautiful kitchen and dining room, they showcase our Ellena Grey Two Seater Sofa and our nesting Carlton end tables. 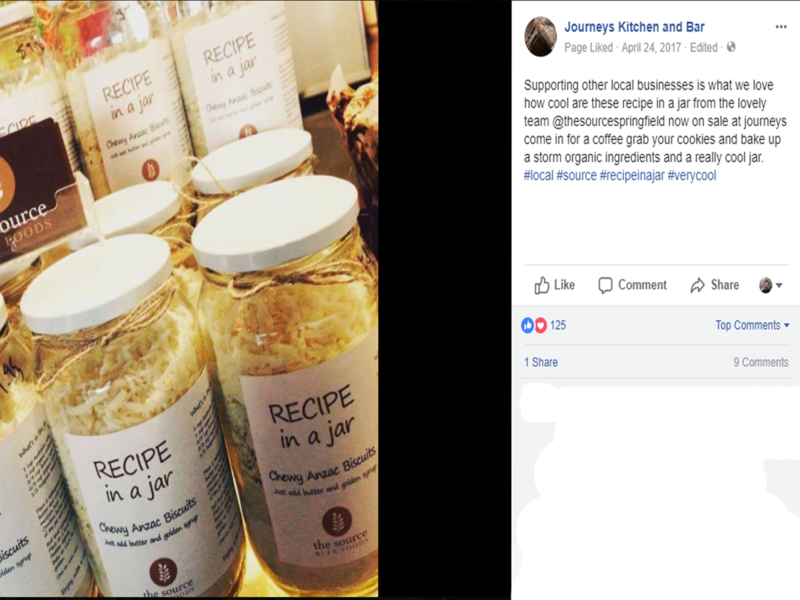 Journey’s Kitchen and Bar works with more than just North Hem as this good-natured post from Facebook shows. 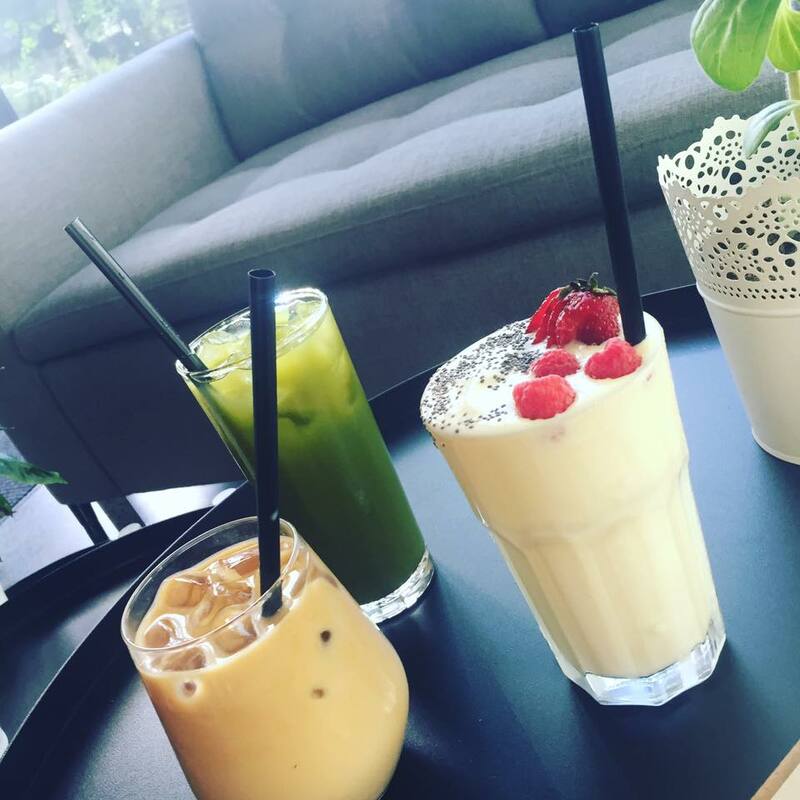 Whether you want to enjoy the ample indoor and outdoor lounge spaces with your amazing desserts and cocktails, or purchase local food to take home, Journey’s has it all. Also, in case you hadn’t heard, there is a comfortable couch to enjoy your ice cream or cocktail. In case you did not notice the furniture for the beautiful drinks, this picture shows our partnership with them well. Journey’s is all about the food, the drinks and the indulgent desserts, but as a showroom partner, our furniture plays an important part in the atmosphere. We love these partnerships because it provides a place for you, our customers, to try out our furniture while enjoying a local business atmosphere that shows the furniture in actual use. 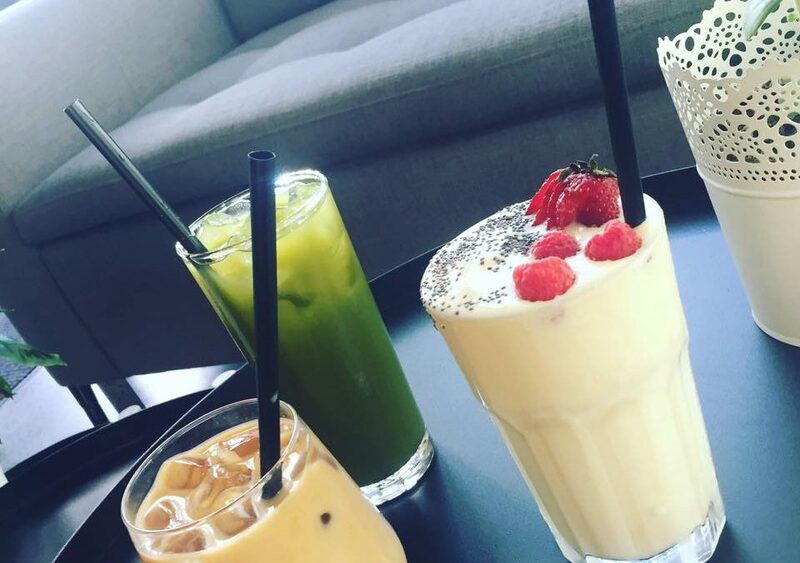 Did We Mention Health Food? 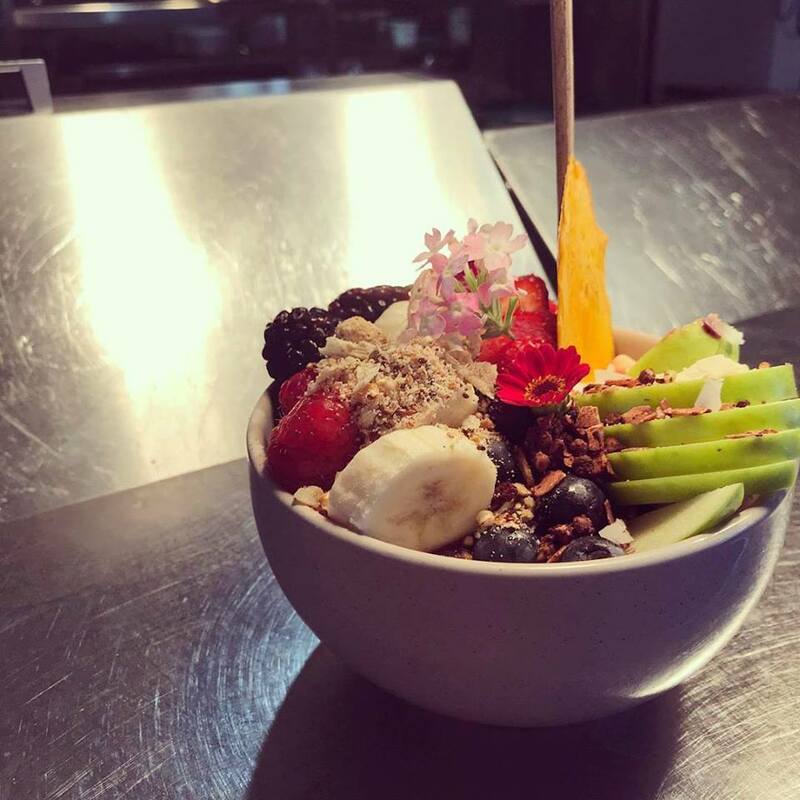 From sweet to savory, you can find it at Journey’s Kitchen and Bar, including the decadent Acai bowl above. Yes, there are savory muffins, fruit, locally smoked hams, and decadent comfort food. If you want to make yourself hungry (and feeling a little bit like you already ate too much), go check out their Facebook page to get a complete picture of the food you can get at Journey’s Kitchen and Bar. FInally, it would not be a kitchen and BAR without some excellent drinks of both the caffeinated and alcoholic variety. 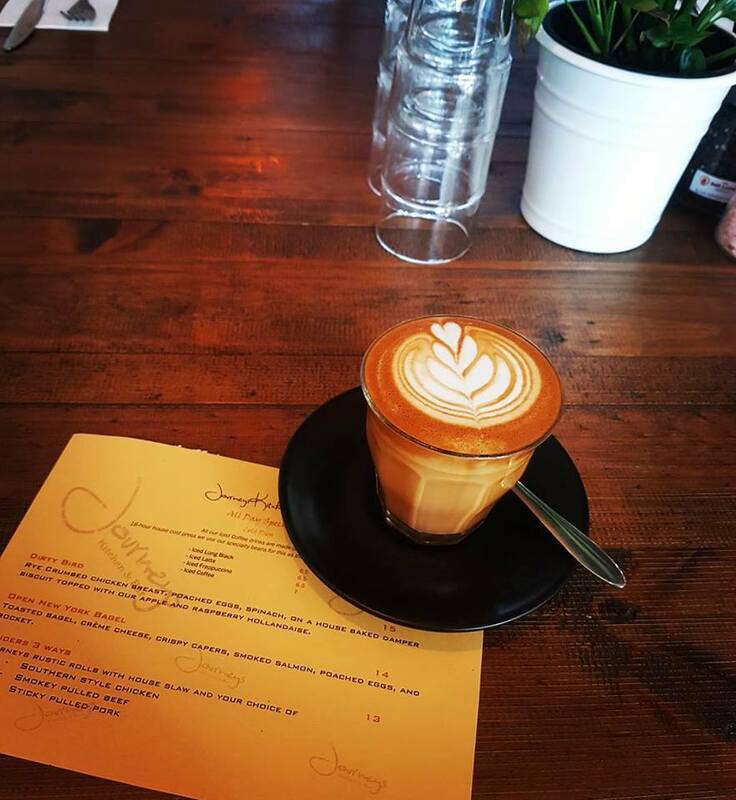 We have shown some of the cocktails in other pictures, so here is a coffee drink for you to realize that there is no reason not to stop by Journey’s Kitchen and Bar if you are in the Springfield Central area. ANd if you stop by, check out our sofa and coffee tables. Interested in Other Local Businesses We Partner With?